The poodle balloon animal is a cute, crowd-pleasing balloon animal for those who have experience twisting balloons. A cool detail to include is a bubble at the end of the poodle's tail. Follow the steps below or watch a video to learn to make a fantastic poodle balloon, a kid-friendly activity great for parties, arts and crafts and fun. Visit a local gift or party shop to get this special balloon. First, you want to inflate the balloon. It is recommended to use a balloon pump, rather than mouth and lungs, for safety reasons. If you are interested in inflating your balloon with mouth inflation, then consult with your doctor first. Inflate the balloon to about six inches from the end, or about 80cm long. After inflating your balloon, create your first balloon twist as shown above. Balloon twisting is also known as balloon modeling, which is how you shape balloons into animals and other sculptures. Twist a basic balloon twist that is about an inch long. This forms the snout of the poodle balloon animal. Follow the next step to continue the head of the poodle balloon with illustration. Twist a second basic balloon twist that is about a half-inch in diameter. Take a look at the picture above to get an idea of how it should look. This is the first portion in the top of the balloon animal's head. Twist a third basic balloon twist that is about an inch in diameter. See photo for guidance on continuing the head. This is the second portion in the top of the balloon animal's head. Twist a fourth basic balloon twist that is about a half-inch in diameter, as illustrated. This is the third portion in the top of the balloon animal's head. Make a lock twist using the two smaller, half-inch diameter segments. You have just formed the balloon animal poodle's head. Twist a basic balloon twist that is about an inch long, as shown above. This basic balloon twist forms the neck of the poodle. Twist two basic balloon twists that are about two inches long. These will form the balloon animal's two front legs. Make a lock twist forming the two front legs of the balloon animal. You have now completed the front portion of the poodle. For instructions on how to complete the poodle balloon animal, you can go to part two of this lesson. In part two, you are repeating what you did with the front legs to make two back legs. With the remaining uninflated balloon, twist off a small bubble (basic twist) and then squeeze it up to the very end of the balloon to "cap off" your poodle balloon's tail. 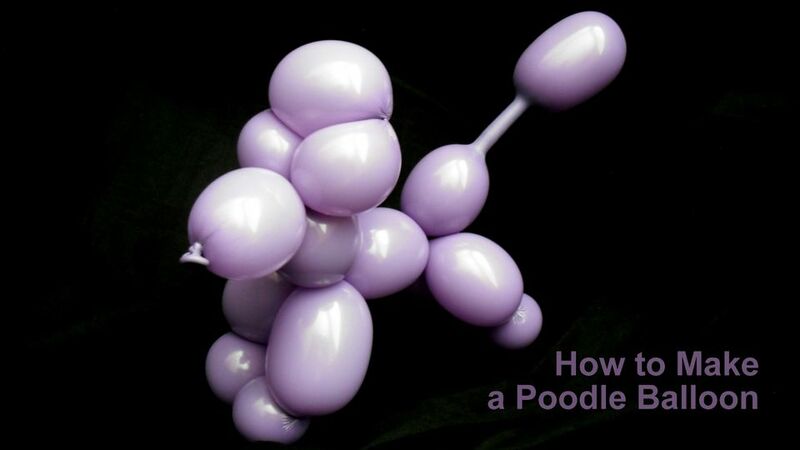 Start making this poodle balloon at an event, and you're sure to have a hit on your hands that will be in demand. Keep in mind that the poodle balloon, although it only requires a single balloon, has many little twists to make. With practice, you can make these fairly quickly, but they will still take far more time to make than a standard dog balloon animal. As a result, when you're working an event, you have to gauge the amount of time you have to make balloons against the number of people waiting for you to make them balloons. If you have too many people waiting and too little time, you'll want to go with simpler balloon animals. In this case, go with the standard dog balloon and not the more complex poodle.